The Puerto Rico Treasury Department will start mailing out today more than 990,000 single, unified tax form that will standardize the reporting process corresponding to the 2013 taxable year. The new streamlined version of the “planilla” is part of a revision of the agency’s internal tax form processing procedures, which seek to expedite the way they are handled. The process is expected to become more efficient, since the new, so-called Single Tax Form will be the same for all taxpayers. The new document replaces the familiar short- and long-form options, and filings will vary only depending on the schedules that individuals will complete and attach according to their case. “To avoid delays in the processing of tax forms, it’s important that taxpayers review the information and documents required before they send their form. The Single Tax Form will include a checklist based on the most common mistakes that taxpayers make when sending their form. This checklist on the cover of the Single Tax Form is an exercise intended to minimize mistakes to speed up the processing of forms,” said Karolee García-Figueroa, deputy Treasury Secretary. Some of the frequent mistakes the agency pointed out are: not including information of all withholding statements (or W2 forms) and the informative returns (480) related to income generated during the taxable year. Aside from offering details on the new tax return, Treasury is also placing special emphasis on filing online, to speed up their processing times. During the 2012 taxable year, more than 557,200 tax forms were filed online, compared to 2011 when 522,990 were filed, for a 6 percent increase. In addition to submitting tax forms online, taxpayers have the option of providing their direct deposit information to receive refunds — when applicable — faster and more securely right into their bank account. García-Figueroa said employers and withholding agents also play key roles in a quick and efficient processing of the forms, as they must send all W2’s and 480’s online — and on time. Failure to comply could translate into fines of $500 per unsent form, the agency official said. More information on the required forms can found at www.haciendateorienta.com or by calling (787) 722-7050. 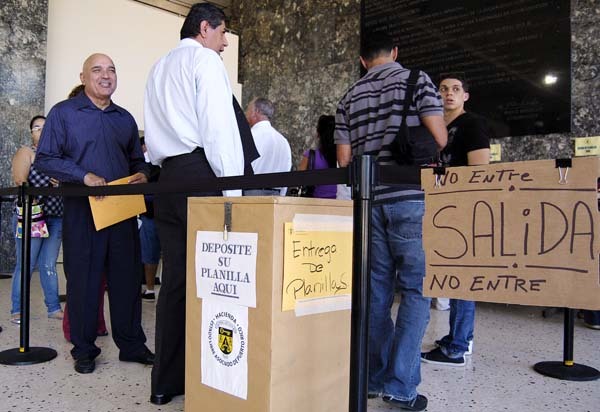 Meanwhile, the online version of the Single Tax Form will be available starting in February at www.planillas.pr.gov. Hey Buddy!, I found this information for you: "Treasury starts mailing new Puerto Rico tax forms today". Here is the website link: https://newsismybusiness.com/treasury-mailing-puerto/. Thank you.